Guest post. Mom just sent this excellent summary of the past year’s work at Sunshine! A lot has been touched on here previously but not with the first-hand knowledge she has had. We have been deep in de-and re-construction at Sunshine, and it’s time for a report. It started Memorial Day a year ago when good friends and family demolished the old fence, carefully preserving the pickets that we could. It was hot, hot, but the chiggers weren’t out yet. We scheduled work days with varying numbers of volunteers, pulling in expertise from far and near as needed. We sanded old pickets, had new ones made, dug new postholes with a two-man augur (this was the day in July when we discovered the chiggers were back in full force), built the rails, painted the rails and pickets, built the gates (added a new one to enter yard at the south end of the porch), puttied the two ORIGINAL front gateposts (made of Bois d’Arc wood and still hard as iron. Meanwhile, our contractor, MC, from Jackson had come up several times and gotten a start on the house work, but I despaired of him spending any real time on the job. A Macon contractor took down the north chimney (by the front bedrooms) that was seriously leaning away from the house and we have slowly been stacking whole bricks for walkways and foundation/steps/whatever and hauling brickbats to fill in low places in the driveway. 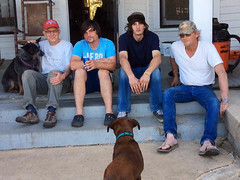 Then suddenly, just as the fence was finished in March, MC who is a restoration expert (not that this is a restoration job, but it is an old house with all the challenges that he loves), freed up his crew and brought them to Sunshine and the real work started. House DE-struction began as they lifted the foundation several inches on the north and lowered it several inches on the south. The wallpaper showed the stress, cracking everywhere, but we knew that would happen. 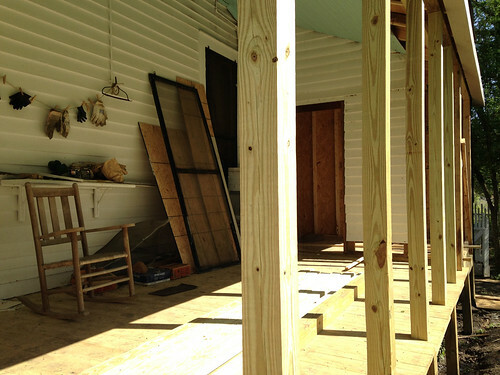 Some of the serious dips and humps in the floor are gone and the house feels more stable, which was all we hoped for. I have heard that people around here describe Sunshine as that two story house that leans. People will still be able to find it that way. They stabilized with cross beams and cleaned the upper attic and we installed (don’t faint) a heating and air system and insulated the attic. This process included the removal of about 12 bags of owl poop and the vacuuming and cloroxing the attic floor! 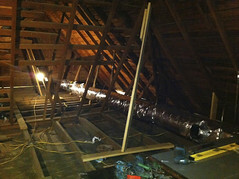 We are considering the possibility of putting HVAC in the lower attic to cool and heat the downstairs too. They took out the chimney between Vanny (Mama Me)’s room and the sitting room. They tore off the back porch and bath and added two feet to both, giving us room to install the shower we inaugurated a couple of weeks ago on Memorial Day weekend. They expanded the little closet in Vanny’s room to make a place for a washer and dryer. They moved the water heater out of the kitchen into the old pantry in the dairy!! I hope y’all are as excited about these details as I am! They have also worked on repairing rotted window frames and sills and making doors and windows work. Even with the devastating tornado damage in Louisville taking up the time of most of the potential electricians and plumbers, we were able to find a good plumber who replaced ALL the plumbing in the house and an electrician who wired the Vanny’s bath and the wash room. And, we are adding a powder room in the back hall under the stairs!! We will also redo, but not expand the upstairs bathroom. After getting the bees out of the kitchen wall, MC has repaired the wall after painting the inside with a sealing paint and stuffing it with insulation to at least give the bees pause if they try to come back. There is no guarantee. Still much to do, including a wire fence for the north side of the yard where we did not replace the picket fence, reducing future maintenance by a little. There will be a drainage system put in on the north side that will keep water out from under the house. Still considering how to make use of the cistern for catching rain water. Might undertake rebuild/restoration of smoke house — it is seriously eaten up with termites, but has been treated. to those that know Sunshine: We would love to hear your thoughts, ideas and memories! PS: The corn was as high as an elephant’s eye across the road and the cotton was peeping up behind the house two weeks ago. The gin did great business last fall and drew in more farmers in its second year of operation. 2 feet added to the back porch! This entry was posted on June 11, 2014 at 10:05 and is filed under update. You can follow any responses to this entry through the RSS 2.0 feed. You can leave a response, or trackback from your own site. Yall seem to have really made great progress! Everything looks awesome.